Besides capturing gorgeous photos (which she's very good at doing), Jessica also works with each of her clients to ensure a stress-free, breezy experience. But, she says, "[a]ll of this does not happen without a well thought out plan for the success of their experience. I have created an intimate experience for my couples to ensure I walk onto their day 100% prepared for each of their memories and special moments." She shares her three step plan for wedding day photography success below, which showcases her attention to detail leading up to her clients’ big day. 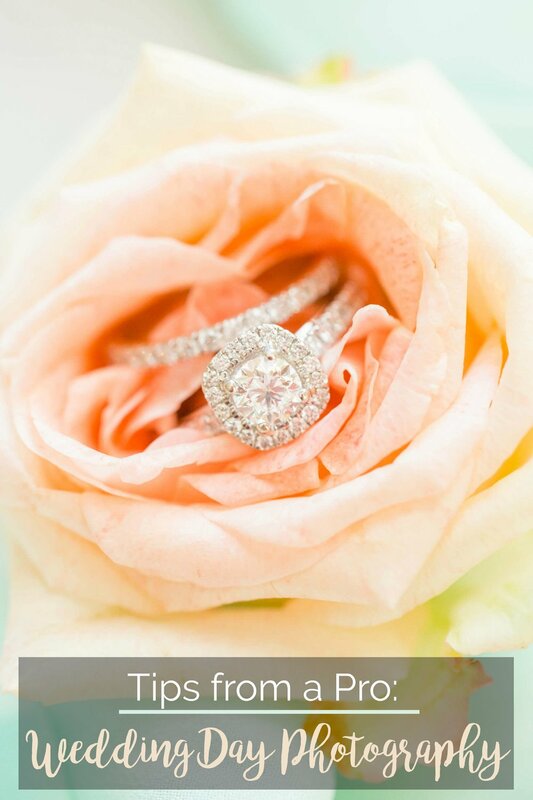 When your photographer is prepared for everything, your wedding stays focused on you, your new spouse, and the love you share...just as it should be! Before she steps foot into your ceremony space, Jessica has already begun to prepare for the day ahead. “I truly believe that walking into a situation without a plan is setting up a plan to fail,” she states firmly. Just as you wouldn’t expect to show up on your wedding day without pre-planning what you’ll wear, what your guests will eat, and what music will play, your photographer shouldn’t show up without a clear plan on how and when to capture those first sweet moments of your marriage. The key to her success has been pre-planning and working with her clients long before they don their gowns and suits. Most wedding photographers may speak with their clients once or twice before the big day via email or phone to discuss general items like when the couple wants them to arrive or the top 5 wedding photos they want to capture. This client lounge functions as a mini wedding planner and fantastic wedding resource, as it provides helpful information on clients’ photography needs--and beyond. “[It] also includes a list of premier wedding vendors local to South Carolina to help my couples in their planning process,” she says. These vendors are people whom Jessica has worked with repeatedly throughout her career who are reliable and caring, and whom provide a similar level of passion in their service as Jessica. The other key element of Jessica’s pre-preparation is getting to know her clients far more deeply than just a phone call or two would provide. When a couple chooses Jessica for their wedding photographer, she sends them 4 detailed questionnaires. Through her clients’ answers, she’s able to better understand their relationship, their likes and dislikes, and their vision for their wedding day. From a photographer who takes such care in getting to know her clients’ before their marriage date, it should come as no surprise that Jessica shows up ready to create some wedding photography magic on the day-of. “My goal for my couples is for them to be able to enjoy their day, be present in their memories, and actually look back on the day with fondness,” she says. After creating a detailed timeline in the pre-planning stage, Jessica watches the clock like a hawk on her clients’ wedding days to ensure everyone sticks to the plan. “Once we agree on the wedding photography timeline that both allows both me and my team enough time to adequately capture what the couple has requested, but also enough time to ensure my couple is able to enjoy their day, we send that plan out to every person on the wedding day who may need it from wedding party attendants to family members to fellow vendors,” Jessica asserts. It really is a no-person left behind situation when Jessica is behind the camera! When there are multiple vendors all working towards the same goal, it helps to have a clear, concise, and written plan. Not only does a pre-written timeline allow the bride and groom to feel comfortable about their day, but it lays out expectations for other vendors as well. You’ve had the wedding of your dreams, you’ve gone on an incredible honeymoon, and you’ve returned home to stacks of wedding presents (and thank you notes to write!). But the one thing you’re missing is access to all of your wedding pictures. Instead of leaving her brides and grooms waiting for months for their photos, Jessica edits and uploads all of her photos within 6-8 weeks of each client’s event date. So, when your great-aunt Sally asks at the family reunion, “Can I see some wedding pictures?” you’ll be able to show off your big day with pride. Says Jessica, “My favorite part of the wedding experience aside from the wedding day is gallery delivery day because I have the extreme honor of sharing a gallery of 700 to 900 gorgeous final images for my couple to enjoy for years and years to come.” Her galleries are stored on secure servers for 10 years after your wedding day to ensure that brides and grooms have the access they need to download, print, and share photos from one of the biggest days in their lives. Ready to partner with Jessica for your big day? Mention Palmetto State Weddings when booking any 2018 or 2019 wedding package, and receive $250 off! Just book by December 31, 2018 to lock in the discount.